Claim: The hole in Pentagon is too small to be caused by a Plane. 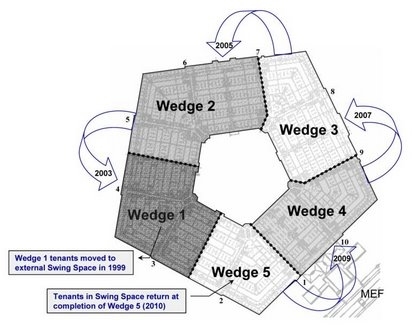 In Brief: When American Airlines Flight 77 hit the Pentagon's exterior wall, Ring E, it created a hole approximately 75 ft. wide, according to the ASCE Pentagon Building Performance Report. The exterior facade collapsed a little less than 40 minutes after impact, but ASCE based its measurements of the original hole on the number of first-floor support columns that were destroyed or damaged. Computer simulations confirmed the findings. Why wasn't the hole as wide as a 757's 124-ft.-10-in. wingspan? A crashing jet doesn't punch a cartoon-like outline of itself into a reinforced concrete building. Claim: There was no identifiable plane debris at Pentagon. The small amount of debris found could be carried away by hand. In Brief: There definitely was plane debris at the site. The impact damage also fit that of an Airplane. The plane travelling at a very high speed and hitting a hard wall creates a huge impact force. This force destroys everything into small pieces. There was debris. If it was carried there before the attack, all the people driving past Pentagon could have caught them redhanded. If it was carried there after the attack, the focus of all the people on the motorway was already at Pentagon. The debris could not have been carried there before or afterwards. A Plane crashed there. Claim: A Missile hit The Pentagon. In Brief: The number of eyewitnesses mentioning a plane is huge. The number of eyewitnesses mentioning a missile is zero. The impact damage fits that of a plane. Pentagon is located in a big city. Pentagon is close to a busy motorway. Could anyone hit Pentagon with a missile, claim it to be a plane and get away with it without risking the operation? No. Claim: How could the passengers be identified if the plane was so destroyed? / There were no passengers. In Brief: What some experts have called "the most comprehensive forensic investigation in U.S. history" ended Nov. 16 with the identification of 184 of the 189 who died in the terrorist attack on the Pentagon. Teams of forensic scientists, under the direction of Demris Lee, technical leader of the Nuclear DNA Section, took over the difficult chore of generating a DNA profile of the victims. Their work included not only the Pentagon crash victims, but the victims of the Somerset County crash as well. Every one of the organization's 102 DNA analysts, sample processors, logistics staff, and administrative personnel were involved -- from collecting, tracking, analyzing DNA samples, and gathering and logging DNA reference material to preparing DNA reports. For 18 days following the terrorist attacks, AFDIL employees worked on 12-hour shifts, seven days a week to meet the mission requirements. There were the bodies and passengers we are told to. Or the 102 analysts are in on the conspiracy. Which one is more likely? Claim: A Video clearly showing Pentagon hit has not been released / there are 85 tapes from Pentagon. In Brief: Video showing the impact from the Pentagon Checkpoint has been released. Video showing the fireball from the Doubletree Hotel camera has been released. Videos have been evidence for the Moussaoui trial, thus not released until 2006. A FOIA request was filled in a effort to get video footage released of the Pentagon crash. 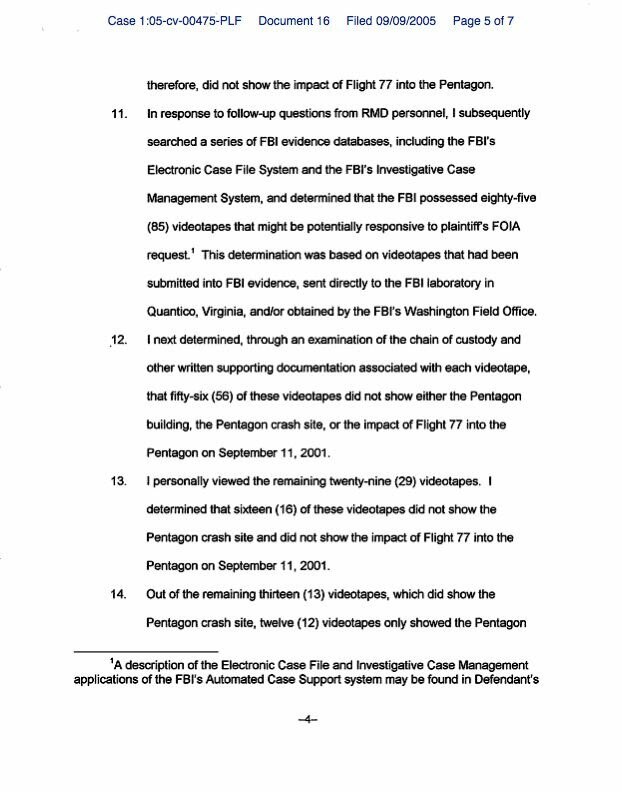 FBI has said 85 videos were potentially responsive to a FOIA request, but a huge majority of them shows neither the Pentagon crash site, nor the impact. Or show the area only after the impact. Only a couple of them show anything at all. Why did agent Maguire (FBI) talk about 85 tapes, then? Why did she think these 85 tapes were potentially responsive to a FOIA request, eventhough all of them were not even of the Pentagon area? The answer lies in the way she determined which tapes could possibly be potentially responsive to a FOIA request. "I searched a series of FBI databases ... and determined that the FBI possessed 85 videotapes that might be potentially responsive to plaintiff's FOIA request. This determination was based on videotapes that had been submitted into FBI evidence, sent directly to the FBI laboratory in Quantico, Virginia, and/or obtained by the FBI's Washington Field Office." The Florida and WTC tapes are included, because Maguire determined that all tapes sent to Quantico, Virginia could be potentially responsive to the FOIA request. The Florida and WTC tapes included in this 85 tape count were all received at Quantico, so she included those tapes to the 85 tapes. Obviously, as all tapes sent to Quantico were not from the Pentagon, she determined that only a few show anything relevant at all. In a nutshell, there are no 85 tapes from Pentagon. There are 85 tapes that an agent determined could potentially show something, since they were received at Quantico, Virginia, or Washington Field Office. Agent Maguire determined, that only 1 videotape showed the impact. This is the Pentagon Checkpoint tape. Surveillance cameras are not 24 frames per second cameras and they are not located in anticipation of an airline attack. We have already seen the impact from one angle and the fireball from two angles. We know there was a plane from all the evidence and eyewitnesses above. Why would we still need to see a crystal clear video? Remember. If there was a clear video, conspiracy theorists would say it was manipulated and photoshopped. That has already been stated by the likes of David Ray Griffin and others. There is always a conspiracy theory. Claim: The Flight 77 Flight Data Recorder data is faked. In Brief: Simply. It is not faked. The analysis claiming it's fake do not take into account everything needed. The data verifies everything about plane hitting the Pentagon. Why would they leave fake information to be found at the Pentagon, then release it to the public for scrutiny? If the FDR data is real, the plane hit Pentagon. If it's faked, why would they fake it not to show a hit? Claim: The fallen light poles are suspicious. In Brief: Multiple eyewitnesses have witnessed the plane hitting the light poles. How could a missile clip light poles? We have all the evidence and eyewitnesses supporting a plane. Why would they have to fake a light pole story? What purpose would that serve? Claim: Hani Hanjour could not pilot the plane into the Pentagon, making such difficult turns. Google video. Amateur with a simulator hitting the Pentagon 3/3 times. Starts at 27:40. In Brief: Hani Hanjour's flying was hardly the show-quality demonstration often described. The manoeuvres required of the hijackers were within their capabilities, they were performed without any degree of finesse and resulted in damage to the targets only after desperate overmanoeuvring of the planes. Landing a plane is difficult. Flying it into something is easier. An amateur pilot in Holland was able to hit Pentagon 3/3 times, when he tried it with a simulator. Hanjour had enough skills to fly a plane. He didn't have to land. Claim: Pentagon had missile batteries to protect it/Pentagon was restricted airspace. In Brief: If they did exist then wouldn’t you have expected Pentagon employees to also have raised this question? An automatic shoot-down of anything that violated the Pentagon airspace is not possible. 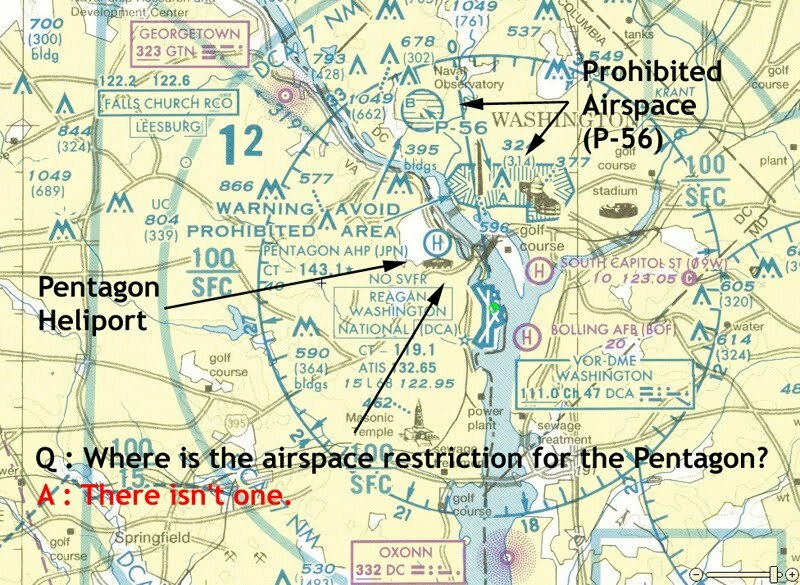 The Pentagon is located very close to the approach for Washingtons Ronald Reagan airport. There has not been any reports of an existence of any missile batteries before 9/11. What comes to restricted airspace over Pentagon, the low altitude chart for the DC area depicts no prohibited airspace above or around the Pentagon. Claim: Why did the hijackers hit the only part of The Pentagon that was recently renovated? In Brief: What actually WAS renovated was Wedge 1. Not the entire side of the Pentagon. Pentagon consists of 5 Wedges, which consist of a corner and half the length of one side of the Pentagon to both directions from the corner. Wedge 1, approximately 1 million square feet, was the first fifth of above ground space in the Pentagon to undergo renovation. Structural demolition and the abatement of hazardous materials began in 1998, followed by the installation of new utilities and the build-out of tenant areas. A phased move-in of tenants began in February 2000, with the last tenant move-in completed February 6, 2003. So the plane hit the side of the Pentagon, which consisted of Wedge 1 to the right of the impact zone and Wedge 2 to the left of the impact zone. The whole Pentagon is undergoing renovation. That part was renovated first, because it is Wedge Number 1. It was also on a direct flight path of the plane. There is nothing strange about this.